Eagle appeared in the first Street Fighter game as a computer controlled opponent, but later appeared as a playable character in the 2001 game Capcom vs. SNK 2. 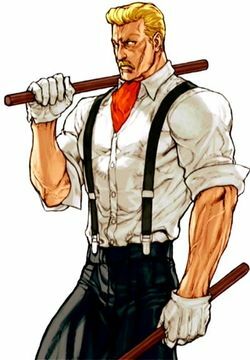 He is a bouncer from England, and his character is reportedly designed as a tribute to Freddie Mercury of the band Queen (something which is also claimed for Sol Badguy from Guilty Gear). This and some of his Japanese win-quotes have lead some to believe he is homosexual or at least readable as such. There is still some debate on the matter. This entry was posted in 1980s, Playable Character, Queer Men, Queerly Read/Rumored on September 11, 2015 by Adrienne Shaw.